Fall is my favorite time to ride here. The autumn leaves are beautiful and the weather is generally fairly mild – cool crisp mornings and blue skies are the norm. That’s what I was hoping for on the 11th. Because of the relatively short notice, I didn’t have much chance to “advertise” so I didn’t know how many riders I’d get. As the date approached I was contacted by a number of people who’d done queries on the RUSA site and noticed there was a brevet on the 11th listing me as a contact. I got a number of emails from people who were “for sure going to come” and were going to bring along a few friends. Although I’d encouraged people to register in advance not many people did which is understandable given the possibility of bad weather. Counting advance registrations and those “expressing an interest” I could have as few as three riders and as many as eighteen. As it turns out, there were five, counting myself. Although disappointed at the small turnout I’ve no complaints at all about the weather. It was cold in the morning – 29 degrees – but the day warmed up nicely and turned into an absolutely beautiful fall day. One advantage of the relatively small turnout was that we were able to ride the brevet Audax style which definitely made it a lot more fun. The route for the brevet is typical of the area, hilly with just under 6K feet of climbing for 128 miles and mostly on quiet two lane farm roads. We had an uneventful ride out past Boaz on CR-E. We rode past a nest that a pair of bald eagles have used every year since we’ve been here. 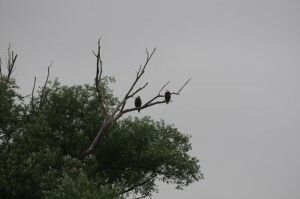 They typically produce one eaglet that survives and it’s always fun to ride past and see its progress. Here’s a picture from earlier in the summer. We made our way without incident through the control at Soldiers Grove and to what would be our longest stop at the food co-op in Viroqua. 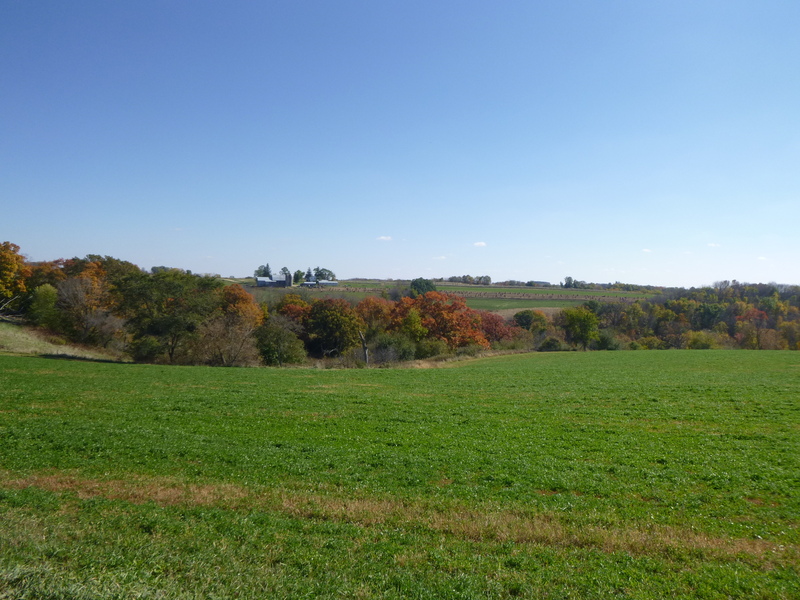 I ride out to Viroqua fairly often and the co-op is a nice place to stop for lunch as we did today. It had warmed up considerably so we also took advantage of the fact that my wife Marcia was there to shed some layers. 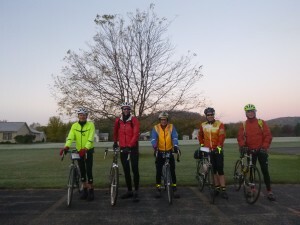 The remainder of the ride was bathed in beautiful sunshine and we rolled along enjoying the fall colors. All in all, about as nice a day on the bike as you could ask for. As it turned out, the beautiful weather was short lived. The next several days were absolutely dreadful with high winds and heavy rain so we really lucked out to have such a beautiful day. Thanks to all who came and to those who didn’t, we’ll do it again next year!